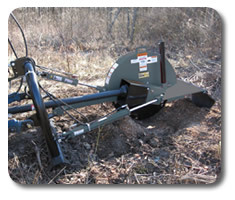 SitePro's SG-26A PTO driven stump grinder is the ideal 3-pt attachment for any property owner. Durable cutting teeth feature a single piece, low profile design for maximum cutting performance. SureFoot™ stabilizer provides solid footing for the unit. Standard pressure relief valve offers precise control of cutting feed rate. This stump grinder attachment offers a rubber deflector to control chips and debris during grinding and a parking stand for easy storage. View our literature. Cutting Wheel Speed (approx.) @ 540 PTO rpm 810 rpm, 5515 ft. / min.